Winning was not the only thing. Something more important than winning football games occurred during the Lombardi Dynasty. Vince Lombardi’s Green Bay Packers ushered the National Football League to the forefront of American sports popularity during a racially explosive time, proving that teamwork transcended the color barrier. Along the way to greatness, Lombardi’s team demonstrated to the NFL, to America, what football looked like in the modern era: blacks and whites working together to win. And win they did. The Green Bay Packers can tell one of the greatest sports stories our nation has ever seen: five World Championships, including three in a row. No team has been able to win three straight World titles since the great Packers squads. With 40 years of reflection, how Lombardi’s Dynasty occurred is much more important than we knew back then. They won championships because of the character of the players. The task was daunting and the results historical. With a collection of competent people, Lombardi pushed, pulled, tugged and led Green Bay — and the NFL — into the modern era. Very little has been written about the defensive side of the ball and because of the attrition of the Packer defensive players from the era, there is very little chance much will be published. 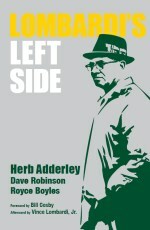 Lombardi’s Left Side is the first — and likely the last — book about the great Green Bay Packers defenses of the Lombardi Era as told by two of Lombardi’s greatest defensive players: Herb Adderley and Dave Robinson. These two players were critical elements in winning championships and moving our country forward in a racially explosive time. The two men who were athletic, bright, courageous, disciplined, hungry, confident, proud, spiritual, decent and black, blazed a trail. They played on the left side of Green Bay’s great defenses of the Lombardi Era. For the first time, Adderley and Robinson share what it was like to be a professional football player in the 1960s through personal stories of Lombardi and his management of the entire Green Bay Packer organization. Articulate and intelligent, Adderley and Robinson cover it all: on the field and off. These two great athletes shut down the left side of the football field and opened up the right side of our minds. Lombardi's Left Side is also available in an autographed, leather bound, collector's edition. This edition is numbered and guaranteed not exceed 500 copies. Each copy is personally autographed by Green Bay Packers Hall of Famers Herb Adderley and Dave Robinson as well as co-author Royce Boyles, on a specially designed vellum page one, which is exclusive to this special edition. Each copy comes complete with a Publisher's Certificate of Authenticity and a special walnut display easel. Each copy is truly one-of-a-kind and will be a treasured display piece in your library or memorabilia collection. Only Available for a limited time and on a first-come-first-served basis. In 1965 All-Pro left cornerback Herb Adderley was the best corner in the game. He is a member of the Pro Football Hall of Fame, five-time Pro-Bowl selection, was tabbed as one of the top 100 players in the history of the NFL, is a six-time World Champion and served as the class action representative for a successful lawsuit against the NFL Players Union. Dave Robinson is a member of the Packers Hall of Fame, College Football Hall of Fame, three-time Pro-Bowl participant, three-time World Champion and serves on the board of directors for the Pro Football Hall of Fame. Royce Boyles has written two previous books about Vince Lombardi and the Green Bay Packer teams of the 1960s. Boyles has established himself as one of the foremost experts of the Lombardi Era with a unique ability to convey the dynamics of the athletic and social issues of the turbulent ’60s.